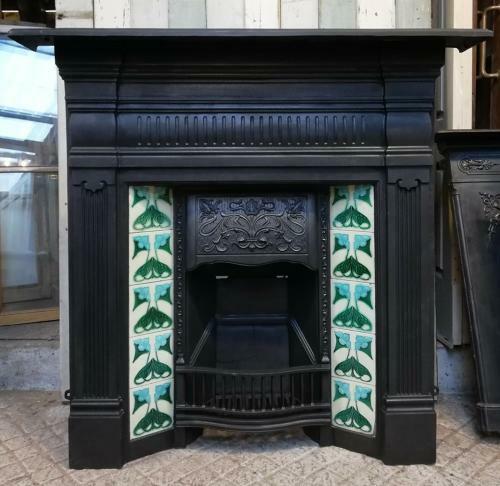 A very attractive large Art Nouveau tiled combination fire. The fire is cast iron with very pretty green, blue and cream tiles on each side of the fire opening. The fire has a beautiful design, typical of the era, with a decorative smoke hood featuring Art Nouveau flowers. The legs have readed mouldings and the fire has the original serpentine front bars. The fire is large and heavy and would be ideal for a living or dining room. The cast iron has been blacked and polished and has a high quality finish. The back of the fire has a registered design mark, RD 421493, dating the fire to 1900 -1910. The fire is antique and has had some repairs. The mantel has had a break which has been repaired to a high standard. The repair is not obvious but can be seen on closer inspection. There is a very small hole within the repaired line. The mantel has new screw fixings. The mantel screw heads have some chips. The concrete fire back has cracks. The back of the fire has surface rust as expected and some small scratches and casting marks can be seen on the front face. The tiles are in good condition but the top left tile does have a crack. There are some slight chips and some crazing to the tile glazing. Top fixing lugs are missing but the bottom fixing lugs are present. We can bolt on metal tabs to replace the top lugs, included in the price, if required. Please let us know at the time of purchase if you would like this service. The fire has a wonderful appearance, highlighting the best of Art Nouveau design. The fire is ideal for a period property and has elegance and charm.